How to activate the iPhone yourself? IPhone activation is the initial device setup process. During this procedure, you must specify the language, region of the user, and some other services. In addition, activation may include restoring phone software from a backup. Those users who have already used this smartphone should be aware of most of the parameters that must be configured when activated. For others, it will be useful to get acquainted with the detailed step-by-step instructions, because in the process of performing this procedure there may be some difficulties. IPhone 4 activation is possible only if the device has a SIM card or a configured wifi network. In addition, in the process of performing this task, you may need a personal computer and high-speed internet connection. This is necessary in case you have to restore the system from a backup. After the preparatory activities are completed, it is necessary to press the power button in the upper right side of the device. 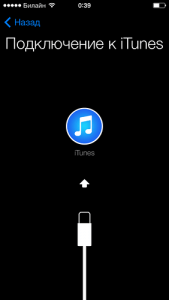 The iPhone will turn on, and a welcome image and a bar to unlock the phone will appear on the screen. In the next step, you will need to set the interface language and region of the subscriber. For most, this task will not be particularly difficult. Then the system is offered to join the existing wifi network (if it is in the vicinity) or use the SIM card to activate the device. A prerequisite for the success of this operation is the presence of the subscriber identification module. If there is no mobile Internet on the phone, you will need to connect to the wifi network or have a personal computer with iTunes installed on it. After performing these operations on the new iPhone, only a few steps are left for full activation. If the phone was purchased with hands, then you will probably need to set an iCloud account and a password set by the previous owner of the smartphone in the device. 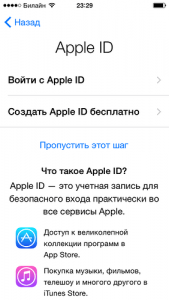 There are situations when the connection with the seller of the used iPhone is lost, and the new owner of the device does not know the login and password for the account. In this case, without the help of the previous owner of the smartphone can not do. Therefore, we can recommend consumers of used Apple phones to reset the device during the sale, in order to avoid possible difficulties and mutual claims. If the phone is new, then difficulties should arise. At the next stage, you will need to choose one of the three options. So it is possible set up a new iPhone, restore system from iCloud copy or restore data from iTunes. All three options have certain differences among themselves. To set up the device as a new iPhone, you need to adjust the device according to your preferences. At the same time, the smartphone will be almost empty and will not contain any information, except for the data that the user can restore from iCloud, if he used this application while working on other Apple devices. Restore from iCloud copy can be done if you have a backup of data from a previous iPhone or iPad. Retrieving previously saved data from iTunes is also not particularly difficult. You just need to synchronize your phone with a personal computer with an installed application and backup smartphone data. After that, follow the step-by-step instructions of iTunes. By the way, it should be emphasized that during this operation, the cable icon and the application itself should be displayed on the smartphone screen. If you choose the first option, the next step is to enter your existing iCloud account or create a new account. 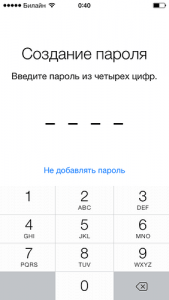 In addition, if the iPhone phone is the first Apple device for a user, you can skip account creation and return to this process after activating the smartphone. 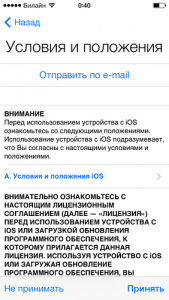 The next step is to read and accept the terms and conditions of the iOS operating system. Now it is advisable to protect your device with a password or Touch ID. This operation is not recommended to be postponed for later in order to improve security and data integrity. Then the system will offer to enable the geolocation option. This tool will help the device determine its own geographic location. And this, in turn, will allow the smartphone to issue relevant and necessary information to the user. 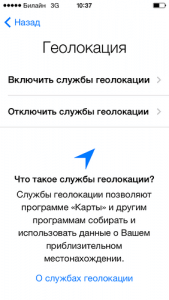 An example is the ability of an iPhone with configured geolocation to show its position on Maps, Google or Yandex. In addition, a smartphone with this activated option will be able to provide the user with information about weather and time in the place where he is currently located. However, you can configure the sending of diagnostic information and give developers access to the device. These tools can be turned on and off at any time and at the request of the owner of the phone. The manufacturer recommends that you leave these items activated, which will enable the device to send information about problems encountered and malfunctions to Apple. In turn, specialists of the manufacturer, analyzing the data received from millions of devices, will be able to improve the quality of services and correct errors. If the user has already been a happy owner of the phone, the iPhone has created a backup of the data stored in the Apple cloud, then you can easily select this item to activate. 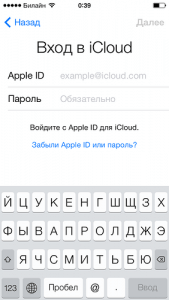 In order to carry out the procedure in this way, you will need to enter into the corresponding window Apple ID and password, which are fixed in iCloud, and then click the Next icon. Subject to the availability of Internet access and the correctness of the entered data will begin downloading and installing a backup. In the process of recovery, the system will ask the user questions similar to that when setting up a new device. It will be by the way to emphasize that the activation of the iPhone will be calmer and faster in the case of high-speed and stable access to the Internet. This is due to the duration of the process of restoring data from a backup. The longest time is the transfer of video and photos. Therefore, it is advisable to carry out the activation procedure with a large amount of backup file if there is enough free time. The last way to activate the iPhone is most suitable for those users who have a very large amount of backup data and at the same time have the opportunity to use a personal computer. Activation via iTunes is the fastest method to perform this operation. The process itself is not particularly difficult. All you need to do is to select the necessary copy of the data (if there are several) in the iTunes program installed on your PC and click on the “Restore” icon. After the backup data is copied to the new device, the system will offer to enable geolocation and protect the iPhone with a password. In addition, you can activate the sending of diagnostic information to developers. In conclusion, you need to emphasize the attention of beginners that after the end of the activation of the smartphone via iTunes, you should not be in a hurry to disconnect the cable from the device. It is required to look closely at the screen of the smartphone. At this point, the process of transferring multimedia files or software may continue and disconnecting the cable may lead to a crash in the operating system. The above tools, how to activate the iPhone, will be able to master not only experienced users of Apple products, but also beginners.